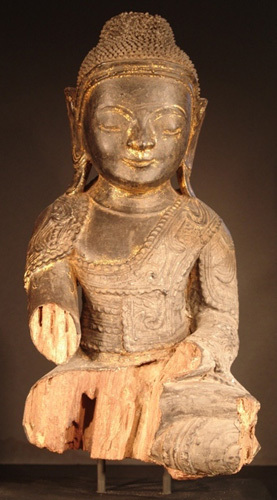 The Shan, who call themselves Tai, form one section of the large Tai ethnic group which is now believed to have spread from Southeast China through Vietnam, Laos, Thailand, Myanmar and Assam. 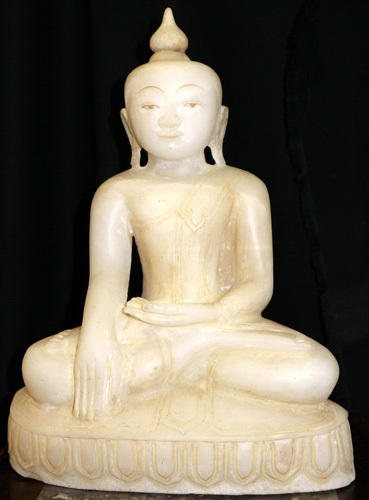 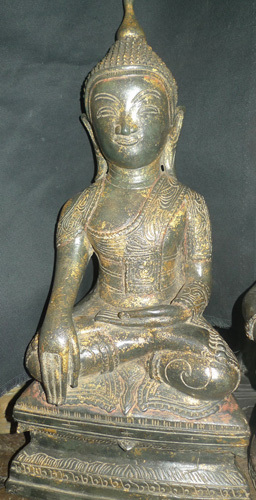 Shan legends indicate that they were already in the part of Myanmar which they still inhabit as early as the mid 16th century. 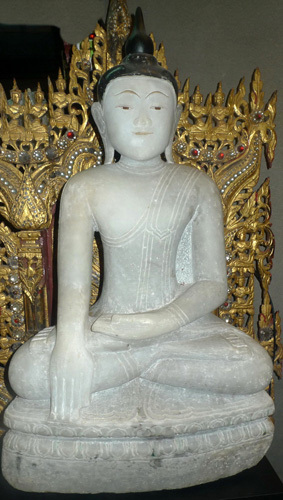 The word 'Shan' comes from the same root as Syam (Siam); in Bagan they were known as the Syam. 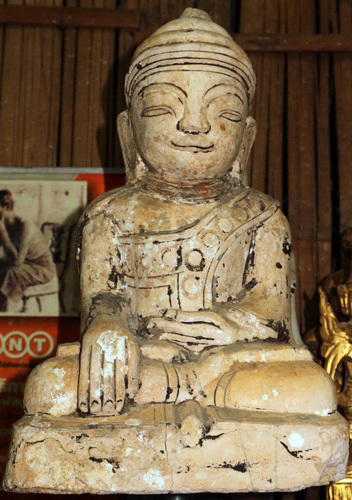 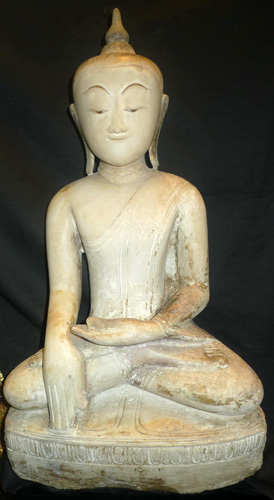 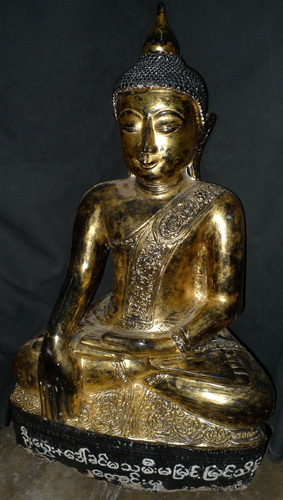 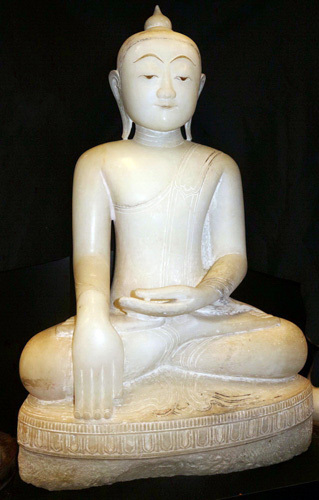 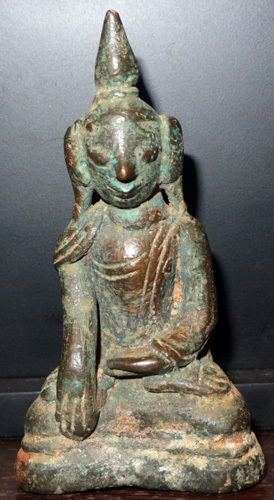 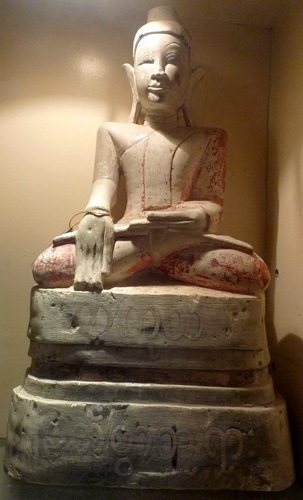 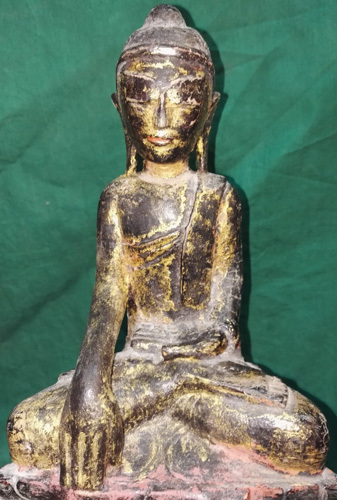 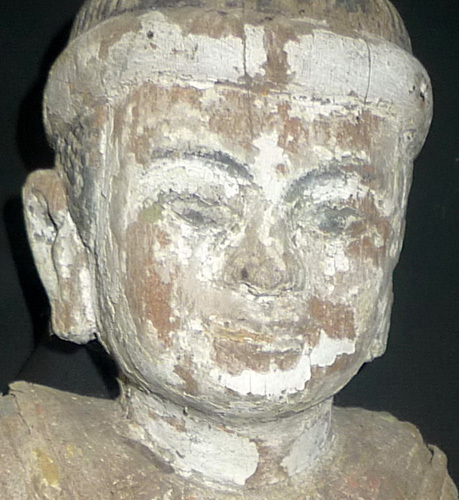 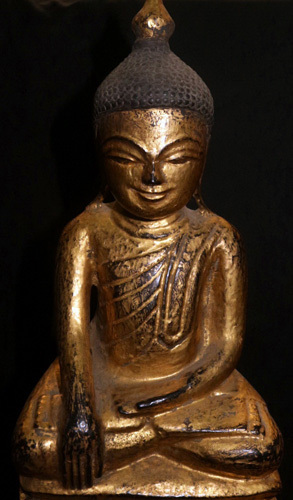 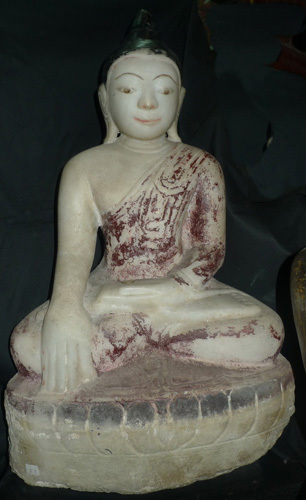 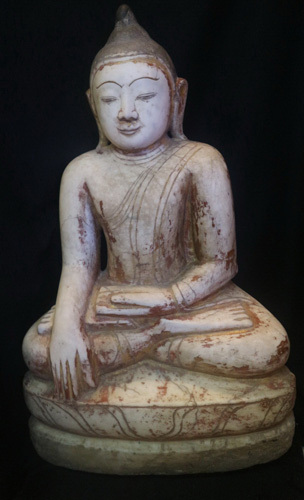 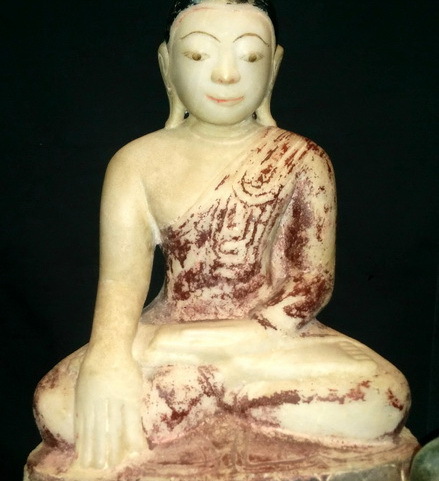 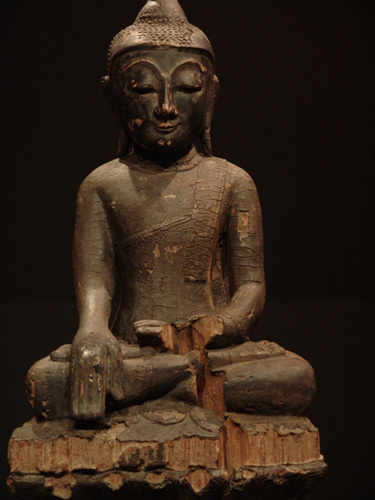 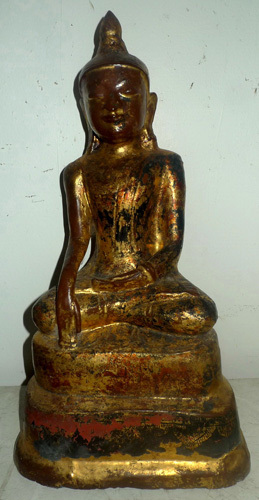 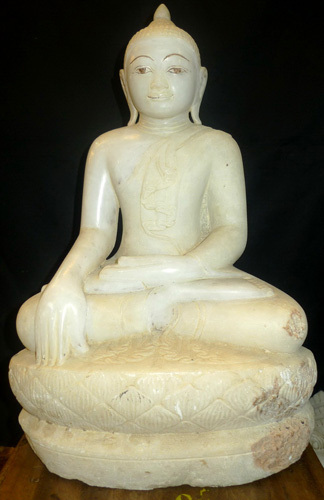 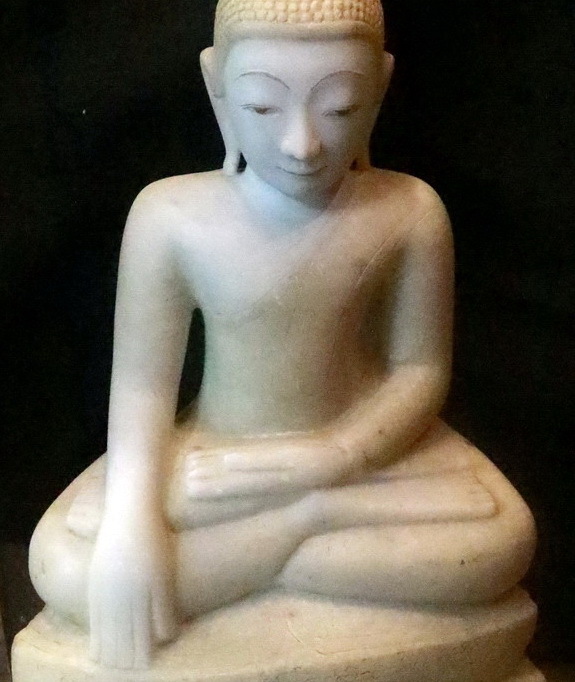 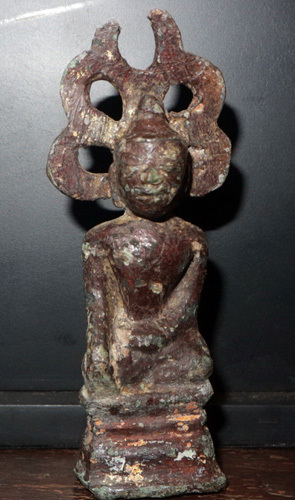 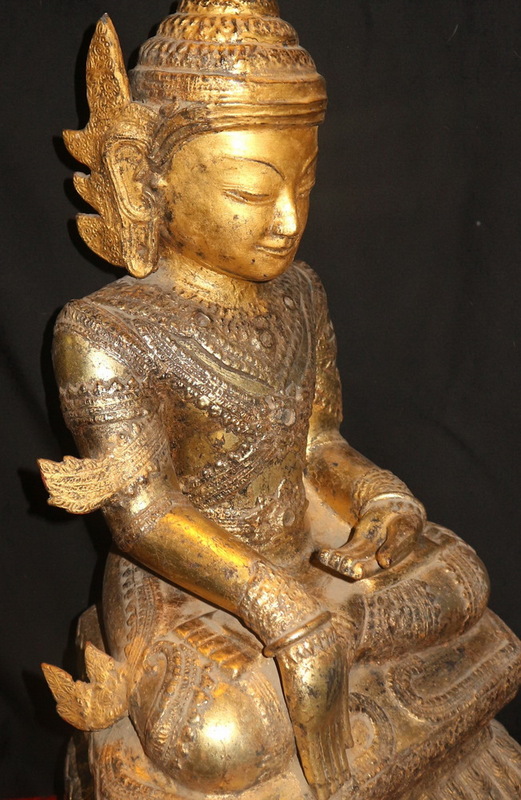 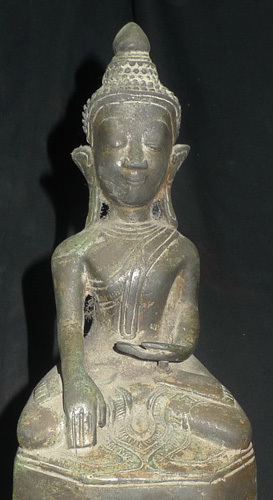 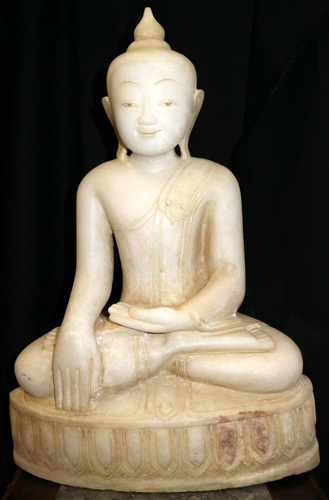 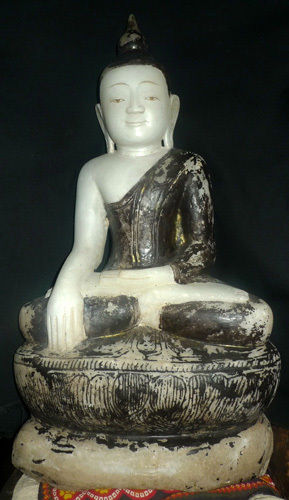 Although there is evidence of occupation by kings of Bagan in and north of the Nyaungshwe Valley in the southern part of the Shan Stated, extant Shan Buddha images appear to date only from the 17th century. 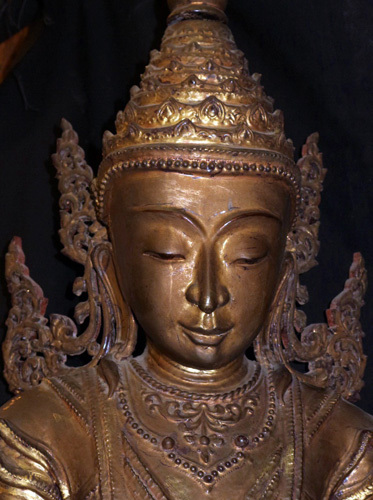 They have triangular faces with a broad forehead, eyebrows arched high over narrowly opened eyes, a pointed nose with triangular nostrils, pursed thin lips, large and elongated ears, and short necks. 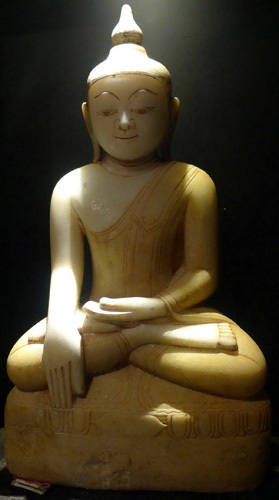 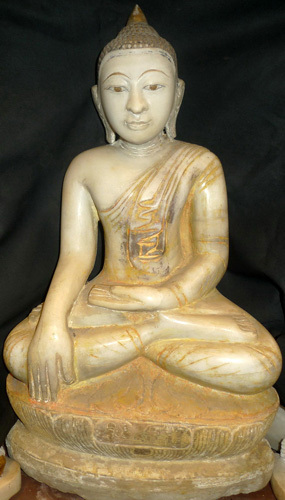 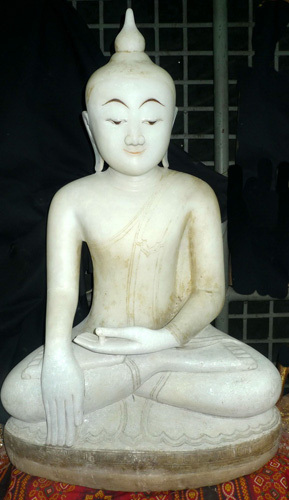 They are often seated in vajrasana with hands in the bhumisparsa mudra. 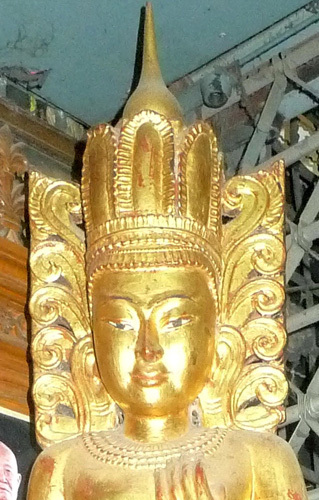 Seventeenth century images may be placed on high, waisted lotus thrones and wear immensely tall crowns with flamboyant nagin (ear flanges). 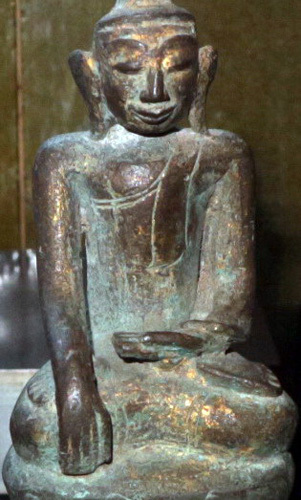 Bhaisajyaguru, a Medicine Buddha of Esoteric Buddhism, was venerated in the 17th century, and according to Dr Than Tun's 1951 study of images in the Pindaya Caves, remained so until the end of the 19th century, with one image of Bhaisajyaguru bearing an inscription of King Bodawpaya (r. 1782-1819). 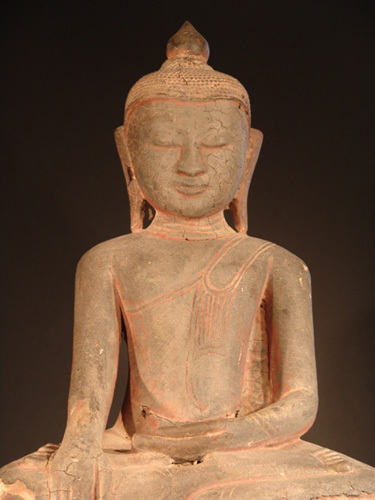 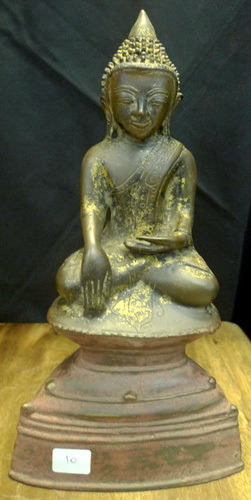 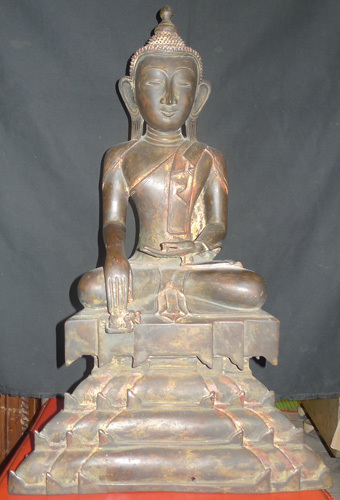 Also popular was the image of the Buddha Gotama seated on a waisted lotus throne with a disciple perched on a lotus stem at each side. 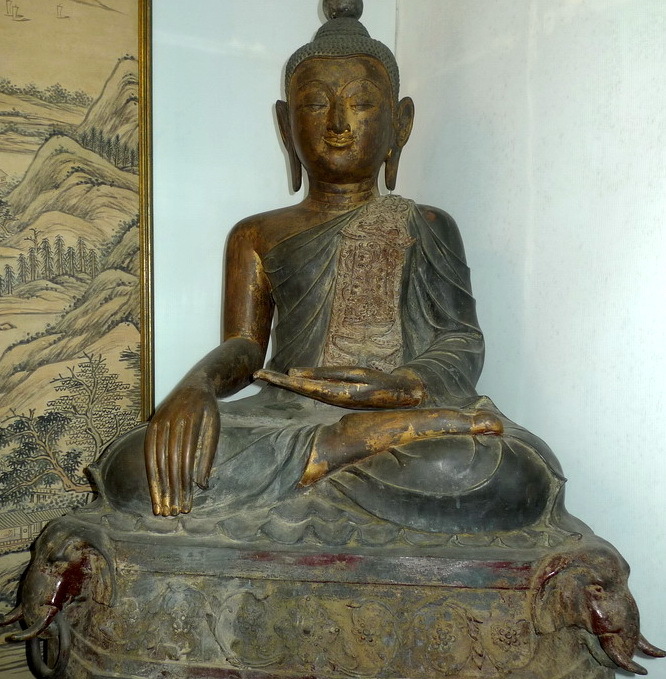 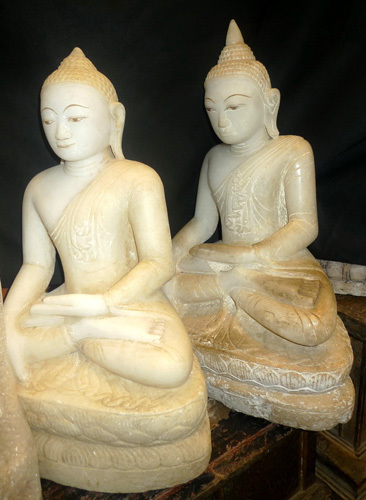 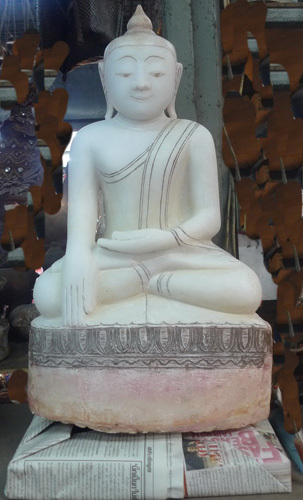 With the passing of the centuries the Buddha's lotus-bud finial became taller, his robes more highly decorated, and the ornaments of royalty more intricate.